Metrotown, a square-mile precinct in the City of Burnaby, was conceived as a zone of medium-to-high density development. It’s well-served by transit, has a huge variety of services within a walkable radius, and an ethnically diverse population of 25,000 or more. Its arterial streets and indoor shopping don’t warm my heart, but who knows what tomorrow may bring? The city’s area plan describes Metrotown as “a town centre serving the southeast quadrant” of a municipality of 225,000. This is too modest. Metrotown’s key property, The Metropolis at Metrotown, is Canada’s second-largest enclosed shopping centre, with vast caverns of free parking and rapid transit lines stopping at the door. The Metrotowers are home to the regional government and regional transportation authorities. 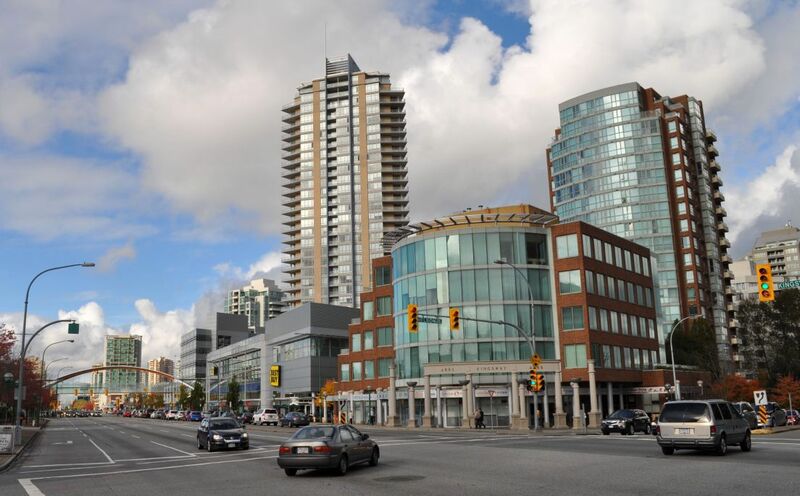 Transit service and a location just outside the City of Vancouver have made the precinct a magnet for towers; it is currently booming, perhaps the most active site for property development in the Lower Mainland. 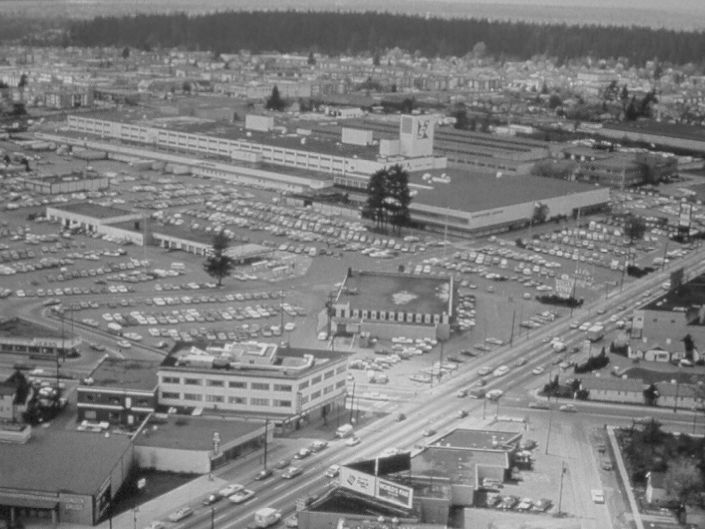 Metrotown had its origins in the early 1970s, when city officials agreed to redevelop 58 acres of under-used industrial land. The resulting area plan, covering more than 700 acres of the city, is unchanged since its adoption in 1977. The plan has a science-fiction aesthetic; filled with detail, it struggles with the question of what its high-density vision will mean to humans. The two-panel photo here shows a photo of a generic tower from the 1977 plan, left, and the fulfillment of the vision today. The plan’s accompanying map has been revised, or reviewed, as recently as July 2012. 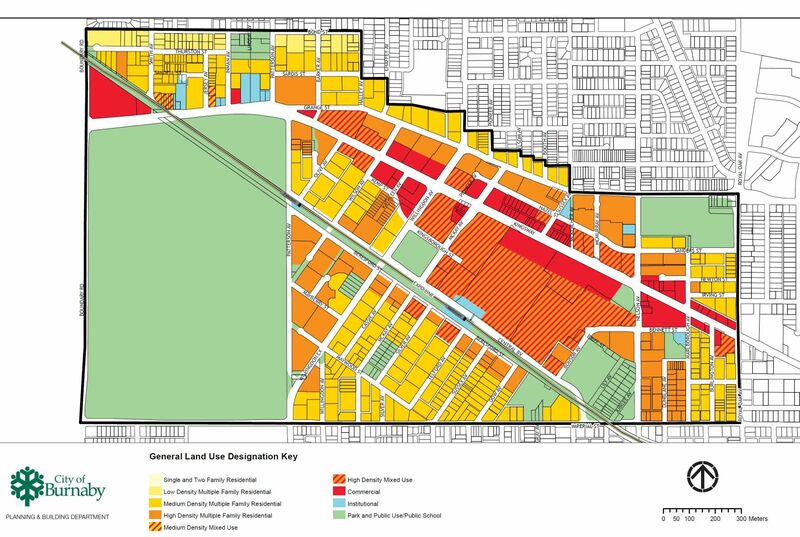 Shown below, it paints all of Metrotown in medium- or high-density colours, except for a few properties on the northwest fringe. In a 2011 newspaper feature, the city’s chief planner said that one of the key objectives of the Metrotown plan is to “protect single-family and two-family neighbourhoods.” (56% of Burnaby’s new population growth from 1996 to 2006 was confined to four high-density areas: Metrotown, Lougheed, Brentwood and Edmonds, all of them built around rapid-transit hubs.) The newspaper story quoted a Green candidate for City Council, Rick McGowan, in opposition to this strategy: “Single-family and two-family neighbourhoods are not sustainable… They can be improved by adding low-rises.” Mayor Derek Corrigan laughed this off, managing to slag the City of Vancouver’s densification policies in the same breath. In the municipal election of autumn 2011, Mayor Corrigan won 76 per cent of the vote in a four-way race, and his slate took all eight Council seats; Mr. McGowan finished 20th of 21 candidates for Council. And so it continues, although the aesthetic is evolving. Tower development has jumped into what I call West Jubilee, a zone of 1950s-vintage walkup rental apartments south of Skytrain. 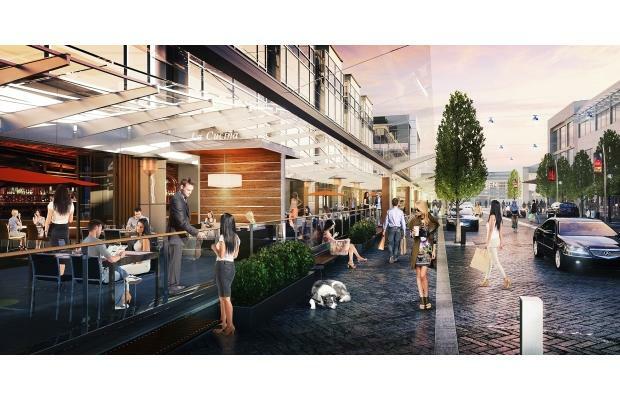 The Metrotown core is to get a facelift, with five new residential towers ranging as high as 57 stories. Sales were launched on October 23, 2012 [However, there was no construction as of March 2016.] The developers in this case are promising to bring some street life to the area, some Yaletown colour; and the city goverment is taking steps on the north side of the Kingsway, making new pedestrian connections to the towers in the outer tier. 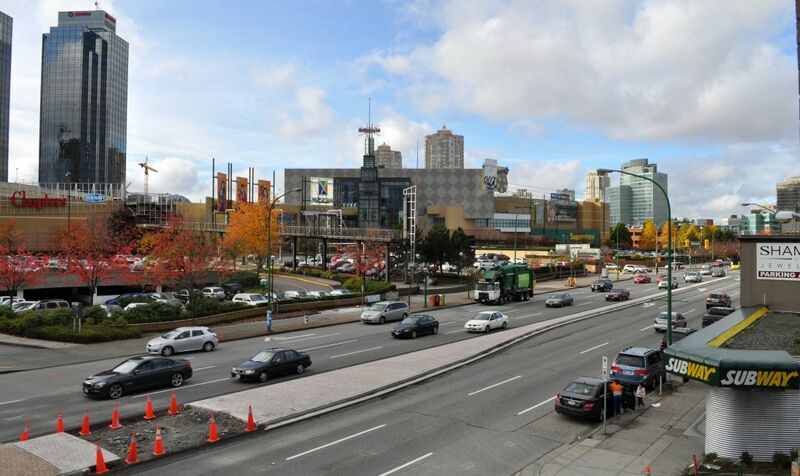 The Metrotown precinct attracts immigrants; in the core, three quarters or more of the residents have come from outside of Canada, mostly from China, Korea, or the Phillipines, according to a provincial government file that has now been deleted from the web. There is an Asian shopping mall adjacent to the main Metrotown centre, and it is safe to predict that the commercial life of the area will become increasingly Asian in character in the coming years. « The Lower Mainland: hub of farming in B.C.